Want to be notified of new releases in vault12/zax? 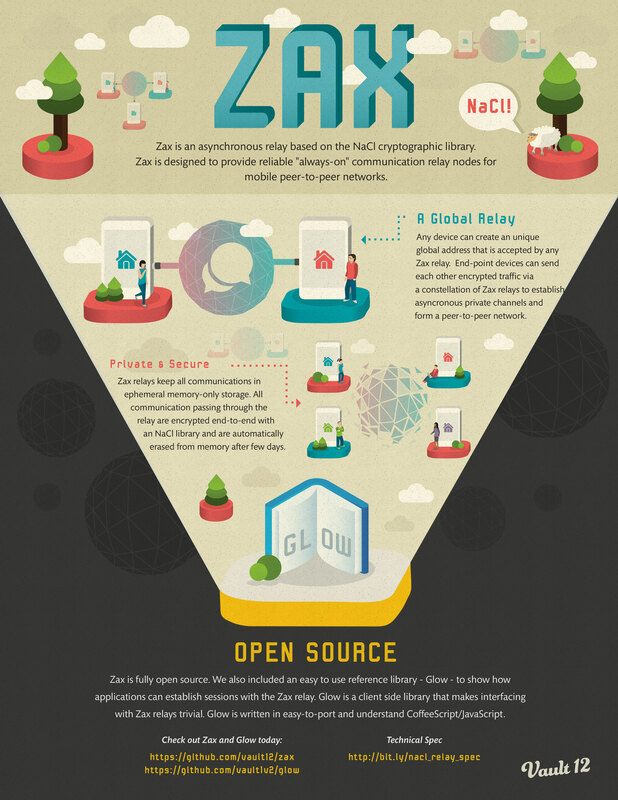 Zax is a NaCl-based Cryptographic Relay, easily accessed via the Glow library. You can read the full technical specification here. Zax relay nodes are asyncronous "dead drops" for mobile communications. Relays are intended to be multiplied for reliability and form a distributed network. Individual devices send messages to a mutually determenistic subset of relays and check the same for response traffic. Zax v2.0 Update summary is here. Universal: All Zax Relay nodes are mutually interchangeable and operate in a global address space. Any mobile device can contact any node to pass private messages to any other mobile device without a pre-existing setup or registration with that Relay. Encrypted end-to-end: It is cryptographically impossible for a Zax Relay node to decrypt the traffic passing though it between endpoint devices even if the Relay is taken over by an external agency. Ephemeral: Zax Relay nodes do not store anything in permanent storage, and operate only with memory-based ephemeral storage. The Relay acts as an encrypted memory cache shared between mobile devices. Key information is kept in memory only and erased within minutes after completing the session. Encrypted messages are kept in memory for future collection and are erased after a few days if not collected by the target device. Well-known relays: A deployed Zax Relay node's URL/identity should be well known and proven by a TLS certificate. Applications might implement certificate pinning for well-known relays of their choosing. A mobile app could keep a list of geographically dispersed relays and use a deterministic subset of them to send & receive asynchronous messages to/from another mobile device. Identification privacy: After establishing temporary keys for each session, a Zax Relay node never stores long-term identity keys of the endpoint devices. When the protocol requires the verification of public key ownership, these operations happen in memory only and are immediately erased afterward. In the future, we're planning on leveraging Zero Knowledge Proofs to eliminate disclosure of long term public keys (and therefore device identity) to a Zax Relay server completely. Resilient: Relays are reasonably resilient to external takeover and network traffic intercept. Such a takeover, if successful, only exposes message metadata, but not the content of any messages. Minor mis-configurations of a relay node, (such as leaking log files, etc. ), during deployment by more casual users do not lead to a catastrophic breakdown of message privacy. Private nodes: Power users have the option to deploy their own personal relay nodes and have the ability to add them into the configuration of mobile applications that are reliant on this kind of p2p network. Each Zax deployment includes (via /public) a test Dashboard app, that uses Glow client library to provide user-friend access point to given relay internal mailboxes. We maintain live Test Server that runs our latest build. For testing purposes expiration on that relay is set for 30 minutes. Any device can communicate with any other device via Zax relays. The address space is global, and each device uses a hash of a long-term identity public key as the “address” in the global network of relays. Devices can generate as many keys as they need and implement communication ratchet protocols on the client level. Clients start by sending a POST request to /start_session with a random token. The relay responds with a simple proof of work challenge based on that token. If the relay is configured for dynamic difficulty adjustment, the proof of work function will increase in difficulty as the relay experiences heavier load (thus increasing the client time required for a new session handshake and reducing load). After answering the challenge to /verify_session, clients receive temporary session keys, and can start posting commands to /command. The command to relay is encrypted with session keys, while payload of command is usually encrypted with recipient public key, and is inaccessible to the relay. Using upload, messageStatus, download and delete commands, client devices can start sending end-to-end encrypted messages to each other. Details of the protocol can be found in the full technical spec. The full client library for messaging commands is implemented in the Glow library. In Zax 2.0 we provide numerous stability and performance updates to the core codebase, and introduced new functionality of extending the Zax “dead drop” style communications to include file exchange. File commands API leverages the existing anonymous message exchange mechanism of Zax relays to bootstrap file exchange metadata and key exchange. After parties have exchanged information about the file, new commands allow for the bulk content of an encrypted file to be exchanged. Bootstrap: Alice and Bob have to exchange their long term identity keys as the usual messaging bootstrap before communications via Zax relays. The Glow library contains a sketch showing how such device-to-device initial key exchange might be implemented in client apps. Read technical specification for the full details of that process. Before a file exchange takes place, we assume that Alice and Bob have already exchanged long term identity keys (pkA and pkB). The relay doesn’t store these public keys, and identifies Alice and Bob by the hash of public key as hpkA and hpkB. Upload init: Alice issues a startFileUpload command that contains the hpk_to address of Bob in a command data block. The data block also includes the metadata encrypted pkA => pkB using NaCl crypto_box, so the whole metadata block is inaccessible to the Zax relay. That metadata block also includes the NaCl symmetric key for crypto_secretbox that will be used later to encrypt the file contents. startFileUpload generates a regular Alice => Bob message on the relay, and can be downloaded by Bob with a regular download command. Alice receives the unique uploadID from the relay that is used for all subsequent commands about the given file. The relay response data block includes the maximum size of file chunk that clients can upload at once. Default is set to 100kb, but clients can modify that value in config, which will require appropriate changes to the size of the maximum POST command in the web server configuration. Internally, the relay stores uploadID only in that initial startFileUpload message, stored in Bob’s mailbox (hpk_to) as a message from Alice (hpk_from). Once Bob or Alice deletes that message via the delete command or it expires as a part of the regular Redis expiration timeout, the relay will have no record of uploadID generated for the file. The relay uses either secret_seed.txt in shared/uploads or a config value to associate the uploadID given to clients and storage_id used by the relay to derive storage file names. If secret_seed.txt is deleted, there is no way to recover an association between files on the relay and client commands. Upload: using the uploadID obtained from the relay, Alice can now issue the uploadFileChunk command, that requires that uploadID. In the command datablock, Alice provides the nonce used to encrypt this file chunk using the symmetric NaCl key for crypto_secretbox. Outside of the command datablock (encrypted as usual with Alice => Relay session key), the encrypted file contents produced by secretbox are posted as additional POST lines to the uploadFileChunk command. The relay stores encrypted file chunks as local files in shared/uploads and derives a storage name from the uploadID and the local secret_seed.txt file. The nonce for each chunk is stored in Redis and subject to the usual time expiration rules. Download: Bob receives the uploadID and secret key for this file when it gets the initial startFileUpload message (by downloading it via the messaging family download command). Bob uses uploadID to issue downloadFileChunk commands to download the file chunk by chunk. It contains in its datablock (encrypted to Bob) the nonce of the given chunk, and the symmetrically encrypted chunk itself is the last line of the POST response to downloadFileChunk command. Status: Either party can check information about files currently on the relay using their uploadID and fileStatus command. If the relay deletes or refreshes secret_seed.txt present during initial startFileUpload, all requests for the old uploadID will fail. Delete: Either party can delete the file using uploadID and the deleteFile command. Data pruning: All Redis information about the files expires, with the default set to one week. If a file is not removed with the deleteFile command, after Redis expiration, the relay will delete old files via a cleanup job. The cleanup job will also delete files that have lost association with their storage id, which is the case if the secret_seed.txt is changed or deleted. The full client library of file commands is implemented in the Glow library. Zax requires Redis to run. We suggest that you use the Ruby Version Manager (RVM) to install Ruby and to build and install the gems you need to run Zax. If you don't already have RVM installed, install it from here. Zax requires at least version 2.4.1 of Ruby to run. If bundle install command fails with a message for libxml2 or Nokogiri, see the Troubleshooting section. For other platforms than OS X, please consult Installing Nokogiri for further instructions. To see Glow and Zax in action, check out the Live Demo. This is a test project included in Zax called Zax-Dash. We encourage you to contribute to Zax using pull requests! Please check out the Contributing to Zax Guide for guidelines about how to proceed. We've set up a public slack community Vault12 Dwellers. Request an invite by clicking here. Zax is released under the MIT License.